One Direction (1D) are a boy band from England and Ireland. It began with Niall Horan, Zayn Malik, Liam Payne, Harry Styles and Louis Tomlinson. They finished third on the seventh series of The X Factor. They each auditioned for The X Factor separately. Simon Cowell, their mentor, put them together in 2010 because he thought they were too good to lose. "What Makes You Beautiful" was One Direction's first single. After being signed to Syco Music, the group recorded their first album Up All Night. Hits on the album include "One Thing" and "Gotta Be You." It was third in the charts. They have been very successful since. They tour to places around the world such as Europe, Australia, Asia, and the Americas. The group released a second album in November 2012, called Take Me Home. It includes the singles "Little Things", "Live While We're Young" and "Kiss You". The group released their third album, Midnight Memories, in late November 2013. It includes the singles "Story Of My Life", "Best Song Ever", "Midnight Memories", and "You & I" Their fourth album, Four, was released in November 2014. This album includes the singles "Steal My Girl" and "Night Changes". 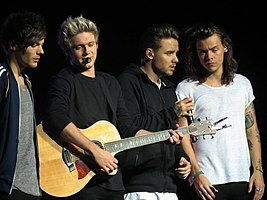 Their fifth album, Made In The A.M., was released in November 2015. It includes the singles "Drag Me Down", "Perfect" and "History". On 29 August 2013, their movie This Is Us was released. In April 2014, One Direction started their stadium world tour titled "Where We Are." 5 Seconds of Summer opened for them during the tour. On 25 March 2015, Zayn Malik left the band. In January 2016, the band said they would be taking a temporary break. It is expected to last around 18 months. One Direction have won two BRIT Awards and four MTV Video Music Awards. Zayn Malik left the band on 25 March 2015. The group decided not to replace him, but continue as a four piece band. ↑ "One Direction - On The Road Again Tour 2015 - ON SALE NOW!". One Direction. Retrieved 15 March 2016. ↑ "Louis Tomlinson Reveals How Long One Direction's Hiatus Will Last". Radio One. Retrieved 2015-12-17. ↑ "One Direction Makes Final 'X Factor' Appearance Before Hiatus, Thanks Fans in New Video". Billboard. 13 December 2015. Retrieved 13 December 2015. ↑ Crookes, Del (26 March 2015). "Zayn Malik is leaving One Direction but group continues as four-piece". BBC Newsbeat. Retrieved 26 March 2015. This page was last changed on 13 April 2019, at 01:51.